Stabilizes the wrist while still allowing full movement of the fingers. Open-cell foam material is cool and breathable and provides comfortable compression. 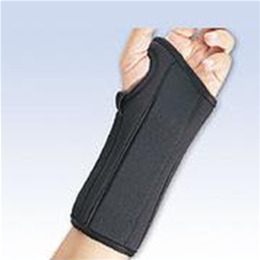 Features a removable palmar stay and two medial/lateral stays for extra support and immobilization. Prevents wrist flexion, extension, rotation, and deviation. Latex free. Specify right or left. Color: Black. Measure around the center of the wrist.